Beck Edge in Braithwaite sleeps 5 people. 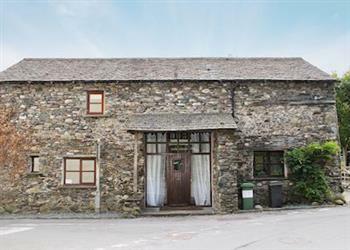 Beck Edge in Braithwaite is a traditional barn conversion. The stunning kitchen/dining room, with granite work surfaces, beams, tiled floor and dining and seating areas, is the perfect place for families to gather and enthuse over the magnificent walks and scenery. There is a separate lounge with oak flooring, cosy wood burner and a galleried landing with seating - perfect for sitting down with a good book and a glass of wine. To ensure plenty of comfort, the master bedroom has en-suite facilities and the owners provide Wi-Fi, logs for the wood burner and towels, in addition to many other amenities. Situated alongside Coledale Beck, at the foot of Whinlatter Pass and in the heart of Braithwaite village, Beck Edge lies just 100 yards from the village shop, restaurant and pub. Some of the areas finest walks are available from the doorstep, including the Coledale Horseshoe, taking in Grisedale Pike and Causey Pike. Whinlatter Forest is a top destination for mountain bikers with beautiful forest trails for walkers and a visitor centre. Keswick, 2 miles, has a wealth of tourist attractions, restaurants, outdoor activities, shops, pubs and the beautiful Derwentwater. Lounge: Beamed with oak floor, wood burner, 32 Freeview TV, iPod dock, Bluetooth sound system and Playstation 2. Kitchen/dining room: Beamed with tiled floor, gas wood burner, electric oven, gas hob, microwave, fridge, freezer and dishwasher. First Floor: Bedroom 1: With double bed and en-suite with shower and WC. All gas, electric, bed linen and towels included. Fuel for wood burner provided. Wi-Fi. Parking (1 car). No smoking. Holidays at Beck Edge run from Saturday to Saturday. For a better idea of where Beck Edge is, you can see Beck Edge on the map below. Beck Edge is in Cumbria; should you be on the lookout for a special offer, you can find all the special offers in Cumbria. It's always worth checking to see what is on offer at the moment. Do you want to holiday near Beck Edge (UK1010), you can see other cottages within 25 miles of Beck Edge; have a look to find your perfect holiday location.